Here is the list of the hotels near Claira. Book your hotel near Claira today, Wednesday 08 May for the best price, reservation and cancellation free of charge thanks to our partner Booking.com, leader in on-line hotels reservation. Below here is the list the 50 closest hotels of Claira, sortable according your criteria. You will find the position of these accommodations on the Claira hotels map. L'Orangeraie, located in Claira, offers studios and apartments with free WiFi and access to an outdoor pool, garden and tennis table. Each accommodation is self-catering and features a private bathroom and garden views. Bed linens, towels and TVs can be rented at an extra fee. An array of facilities/services are offered at the property, including bicycle rental, an airport shuttle service, massage service, facilities for disabled guests and BBQ facilities. Breakfast can be enjoyed at restaurants in the village, about a 5-minute walk away. During your stay you might be interested to visit the small city of Perpignan, the last major town before the Spanish border, a great place to sample regional food and wine. This holiday home is 7 km from Rivesaltes Airport. Located in the countryside of Claira, La Maison de Vérotte provides guest rooms, apartments and yurts, just 16 km from Perpignan. You can enjoy the outdoor swimming pool and borrow the free bicycles to discover the area. All of the accommodations at La Maison de Vérotte are heated and uniquely decorated. They are all equipped with free Wi-Fi. Guests staying in the apartment will have access to a kitchen and there is a restaurant 2 km from the property. You can relax with a drink from the bar. A continental breakfast with homemade jams is served daily with an extra cost and dinners with traditional dishes from the region are also available, upon prior reservation. Facilities for playing pétanques also feature at La Maison de Vérotte. Free private parking is possible on site and the property is 9 km from Le Barcarès and the beaches. Located in the heart of Sainte-Hippolyte, Casa Clara offers B&B accommodation, just a 5-minute drive from the beaches. You can swim in the outdoor swimming pool, enjoy the hot tub and relax on the sun loungers. All of the rooms at Casa Clara are uniquely decorated and air-conditioned. Each room also has a private bathroom with a bath. Some of the rooms also feature garden and pool views. Breakfast homemade jams, freshly squeezed fruit juice, yoghurt and cheese is included and served each morning in the dining room. Traditional dinners are also available upon prior reservation and restaurants can be found 200 metres away. Free Wi-Fi is available throughout the property. Free public parking is possible on site and Torreilles Beach is 10 km from Casa Clara. Located in the heart of Torreilles village, La Vieille Demeure features accommodation in a guest house offering free Wi-Fi throughout and a heated, salt-water pool. Access to the Mediterranean sea is possible just 3 km away. The guest rooms feature a wardrobe, a flat-screen TV and an en suite bathroom with shower. Some rooms also have air-conditioning, a private terrace and views of the patio. Every morning, a continental breakfast is served on site. Meals can also be prepared by the host upon request. Guests can sample typical Catalan food in the village’s restaurants, situated just 100 metres away or eat on the beach, just 4 km away. Guests can drive 10 km to visit Perpignan or reach its train station. Perpignan Airport is 13 km away. The Spanish border is a 40-km drive away. Guest accommodation Torreilles Preferred hotel ! Chez Veronika is set in Torreilles and offers a shared lounge. The homestay, set in a building dating from 19th century, offers free WiFi. This air-conditioned homestay comes with a dining area, a kitchen with a dishwasher, and a flat-screen TV. Perpignan is 12 km from the homestay, while Collioure is 35 km away. Perpignan - Rivesaltes Airport is 14 km from the property. Offering a shared garden, Mas Sant Salvador is a centuries old country house, situated in Bompas. The property is located 10-minutes' drive from the beaches and Perpignan. Free WiFi is available and free private parking is available on site. There is also a kitchen, fitted with a refrigerator. Collioure is 26 km from Mas Sant Salvador, while Argelès-sur-Mer is 21 km away. The nearest airport is Rivesaltes Airport, 7 km from the property. In the heart of the Catalan village of Toreilles, Le Paillé de Torreilles is 4 km from the Mediterranean Sea and offers free Wi-Fi throughout, homemade cooking and air-conditioned accommodation. The rooms at Le Paillé de Torreilles are decorated in an elegant style and include wooden furniture and parquet floors. An electric kettle is also provided. A flat-screen TV with cable and satellite channels, and a private bathroom complete with shower and hairdryer also feature in the rooms. You can share meals with other guests and savour homemade cuisine made with local products. Reservations are recommended. Le Paillé de Torreilles is 10 km from Perpignan and 30 km from Collioure, and Font Romeu is 30 km away. Lagrange Grand Bleu Vacances – Résidence Le Mas de Torreilles is situated on the Catalan coast, 1 km from the beach. It offers a heated outdoor swimming pool, as well as fitness and leisure facilities. The villas are air conditioned and have flat-screen TVs and fully equipped kitchenettes. A WiFi connection is available for an extra charge. Lagrange Grand Bleu Vacances – Résidence Le Mas de Torreilles is 12 km from Perpignan and is also in close proximity to Collioure and the Pyrénées Mountains. Free parking is available. Featuring an outdoor pool and pool views, Holiday home Bis rue St Michel is located in Pia. The property features garden views and is 8 km from Perpignan. The holiday home features 3 bedrooms, a TV with satellite channels and a fully equipped kitchen that provides guests with a dishwasher and an oven. The holiday home offers a barbecue. Collioure is 36 km from Holiday home Bis rue St Michel, while Argelès-sur-Mer is 30 km from the property. Perpignan - Rivesaltes Airport is 7 km away. Situated in Saint-Laurent-de-la-Salanque in the Languedoc-Roussillon Region, 12 km from Perpignan, Chambre d'hôtes du Mas Julianas boasts a sun terrace and views of the garden. Each room includes a flat-screen TV. Chambre d'hôtes du Mas Julianas features free WiFi throughout the property. You will find luggage storage space at the property. Collioure is 29 km from Chambre d'hôtes du Mas Julianas, while Narbonne is 46 km away. The nearest airport is Perpignan - Rivesaltes Airport, 11 km from the property. Situated in Saint-Laurent-de-la-Salanque in the Languedoc-Roussillon region, Gite Theresa is a 3-star property featuring free WiFi. Guests staying at this holiday home have access to a fully equipped kitchen and a terrace. The holiday home is equipped with a flat-screen TV, 1 bedroom and a living room. Guests can also relax in the garden. Perpignan is 15 km from the holiday home, while Collioure is 39 km from the property. The nearest airport is Perpignan - Rivesaltes Airport, 18 km from the property. Bed and Breakfast Pia Preferred hotel ! O2 Saveurs Chambre D' hotes offers accommodation in Pia. The bed and breakfast has a seasonal outdoor pool and views of the pool, and guests can enjoy a meal at the restaurant. Certain units have a private bathroom with a spa bath, while others have bath robes and free toiletries. Some rooms feature a seating area where you can relax. You will find a coffee machine in the room. A flat-screen TV is featured. There is a shared lounge, concierge service, gift shop, and shops at the property. A range of activities is offered in the area, such as snorkeling and diving. Perpignan is 5 km from O2 Saveurs Chambre D' hotes, while Collioure is 28 km away. The nearest airport is Rivesaltes Airport, 3 km from the property. Set in Villelongue-de-la-Salanque, Four-Bedroom Holiday Home in Villelongue provides accommodation with a private pool and free WiFi. Guests staying at this holiday home have access to a fully equipped kitchen. The holiday home offers an outdoor pool. Perpignan is 10 km from Four-Bedroom Holiday Home in Villelongue. Perpignan - Rivesaltes Airport is 12 km away. Apartment Bompas Preferred hotel ! Located 7 km from Perpignan in the town of Bompas, Résidence des Palmiers features an outdoor swimming pool, garden and sun terrace. It is a 15-minute drive from the beach in Canet-Plage. Studios and apartments at Résidence des Palmiers each have a private terrace, a seating area and a fully equipped kitchen. Restaurants, bars and grocery shops can be found 500 metres away. Free Wi-Fi access is provided on site. Dinner is available at the property upon reservation. Guests can visit the nearby caves Grandes Canalettes, Canalettes and Cova Bastéra, and the Solar Furnace at Odeillo is 40 km away. The property is 8 km from Perpignan Airport and a 30-minute drive from the Spanish Border. Free private parking is available on site, upon reservation and is subject to availability. Situated in Torreilles, Mas Catalan provides accommodation with free WiFi, seating area and a kitchen. Each unit is fully fitted with a washing machine, a flat-screen TV, a sofa and wardrobe. A terrace with garden views is offered in every unit. Perpignan is 19 km from the holiday home, while Collioure is 37 km from the property. The nearest airport is Perpignan - Rivesaltes Airport, 22 km from the property. Set in Torreilles in the Languedoc-Roussillon region, Holiday Home Le Mas de Torreilles.1 features a terrace. Guests staying at this holiday home have access to a fully equipped kitchen. The holiday home includes 2 bedrooms and a living room with a flat-screen TV. Private parking is available at the holiday home. Perpignan is 19 km from Le Mas Toreiles Toreiles, while Collioure is 37 km from the property. Perpignan - Rivesaltes Airport is 22 km away. Holiday Home Le Mas de Torreilles.3 is situated in Torreilles. Guests have a private terrace. The holiday home has 3 bedrooms, a flat-screen TV and a fully equipped kitchen that provides guests with an oven and a microwave. Private parking is available at the holiday home. Perpignan is 19 km from Le Mas De Torreilles, while Collioure is 37 km from the property. Perpignan - Rivesaltes Airport is 22 km away. Holiday Home Les Mas de Toreilles.2 is situated in Torreilles. Guests staying at this holiday home have access to a terrace. The 2-bedroom holiday home is fitted with a living room with TV, and a fully equipped kitchen with dishwasher. Private parking is available at the holiday home. Holiday Home Les Mas de Toreilles.2 offers a children's playground. Guests can also relax in the garden. Perpignan is 19 km from the accommodation, while Collioure is 38 km away. The nearest airport is Perpignan - Rivesaltes Airport, 22 km from the property. Holiday Home Les Mas de Toreilles.3 is situated in Torreilles and offers a garden and a bar. The property is 19 km from Perpignan, and private parking is offered. The holiday home comes with a TV and 3 bedrooms. There is a dining area and a kitchen equipped with a dishwasher. The holiday home offers a children's playground. Collioure is 38 km from Holiday Home Les Mas de Toreilles.3. The nearest airport is Perpignan - Rivesaltes Airport, 22 km from the property. Holiday Home Les Mas de Toreilles.4 is located in Torreilles and offers a garden. This holiday home provides a bar. The holiday home has 3 bedrooms and a fully fitted kitchen with a dishwasher and a microwave. A TV and a DVD player are provided. The holiday home offers a children's playground. Perpignan is 19 km from Holiday Home Les Mas de Toreilles.4, while Collioure is 38 km away. The nearest airport is Perpignan - Rivesaltes Airport, 22 km from the accommodation. Holiday Home Les Mas de Toreilles.1 is situated in Torreilles. Guests staying at this holiday home have access to a terrace. The holiday home has a TV and a living room. The accommodation is fitted with a kitchen with a dishwasher and a microwave. The holiday home offers a children's playground. Guests can relax in the garden at the property. Perpignan is 19 km from Holiday Home Les Mas de Toreilles.1, while Collioure is 36 km from the property. The nearest airport is Perpignan - Rivesaltes Airport, 22 km from the accommodation. Situated in Villelongue-de-la-Salanque, Mas de la Riviere is situated on the banks of Têt River. It features free WiFi access and free private parking on site. Each unit has a fully equipped kitchen, a living room with a flat-screen TV and a bathroom. A garden with outdoor furniture and a barbecue is offered in every unit. Mas de la Riviere offers a shared outdoor pool. Shared shower room and laundry room are at guests' disposal. A children' playground, a table tennis table and a pétanque strip are available. Perpignan is 7 km from the accommodation. Perpignan - Rivesaltes Airport is 10 km away. Featuring free WiFi and a seasonal outdoor pool, Mas Latour Lavail is a guest house in Perpignan, located just 4 km from the city centre. Free private parking is available on site. The rooms come with a flat-screen TV. Every room includes a private bathroom. For your comfort, you will find bathrobes, free toiletries and a hair dryer. Breakfast is available every morning and is included. The nearest airport is Rivesaltes Airport, 4 km from the property. Situated in Torreilles in the Languedoc-Roussillon region, Three-Bedroom Holiday Home in Torreilles - Plage is a 2-star property boasting free WiFi. Guests staying at this holiday home have access to a fully equipped kitchen. The holiday home is equipped with a TV, 2 bedrooms and a living room. The holiday home offers an outdoor pool. Perpignan is 19 km from Three-Bedroom Holiday Home in Torreilles - Plage, while Collioure is 37 km from the property. The nearest airport is Perpignan - Rivesaltes Airport, 22 km from the property. Boasting barbecue facilities, Le Village Marin Catalan provides accommodation in Torreilles with free WiFi and garden views. The property was built in 2004 and has air-conditioned accommodation with a terrace. This 2-bedroom holiday home comes with a seating area, a flat-screen TV, a Blu-ray player and a kitchen with a dishwasher. The holiday home also has 1 bathroom. Guests can relax in the garden at the property. Perpignan is 20 km from the holiday home, while Collioure is 37 km away. Perpignan - Rivesaltes Airport is 23 km from the property. Set in Torreilles in the Languedoc-Roussillon region, Village marin catalan is a 3-star property boasting free WiFi. The accommodation is 20 km from Perpignan. The holiday home has a flat-screen TV, a well-equipped kitchenette with a dishwasher, and 1 bathroom with a bath and free toiletries. Collioure is 37 km from Village marin catalan, while Argelès-sur-Mer is 31 km away. The nearest airport is Perpignan - Rivesaltes Airport, 23 km from the accommodation. Featuring accommodation with a terrace, Holiday Home Les Aloès is situated in Sainte-Marie-la-Mer. The accommodation is 14 km from Perpignan. The holiday home includes 3 bedrooms and a kitchen with a dishwasher and an oven. A TV is available. Collioure is 31 km from the holiday home, while Argelès-sur-Mer is 25 km away. The nearest airport is Perpignan - Rivesaltes Airport, 19 km from Villa Sainte-Marie. Set 10 km from Stade Gilbert Brutus, Escapades Lointaines offers a free bikes, and accommodation with a terrace and free WiFi. The accommodation is air conditioned and has a sauna. Each unit is equipped with a microwave, toaster, a coffee machine, as well as a fridge and kettle. A flat-screen TV with satellite channels and DVD player are available in some units. A continental breakfast is available each morning at the property. The bed and breakfast offers a hot tub. Guests can swim in the outdoor swimming pool or relax in the garden. Perpignan Convention Centre is 7 km from Escapades Lointaines. The nearest airport is Perpignan - Rivesaltes Airport, 13 km from the accommodation. Situated in Sainte-Marie-la-Mer, Holiday Home VILLA CANIGOU features accommodation with a private pool. Guests staying at this holiday home have access to a fully equipped kitchen and a terrace. The holiday home has a TV and 3 bedrooms. Perpignan is 15 km from the holiday home. The nearest airport is Perpignan - Rivesaltes Airport, 19 km from Holiday Home VILLA CANIGOU. Offering an outdoor swimming pool and barbecue facilities, that is complemented with a garden, Mas Des Fleurs is located in Perpignan, 6 km from Stade Gilbert Brutus. Housed in a building dating from 19th century, this holiday home is 2.9 km from the Perpignan Convention Centre and provides free WiFi. The holiday home comes with a satellite flat-screen TV. A dishwasher, an oven and a microwave can be found in the kitchen. The holiday home offers a children's playground. Mas Des Fleurs features a terrace. Chamber of Commerce is 3.9 km from the accommodation, while Perpignan Town Hall is 4 km away. Perpignan - Rivesaltes Airport is 9 km from the property. Guest accommodation Le Barcarès Preferred hotel ! Located in Barcarès, Résidence La Pinède offers an outdoor swimming pool, free WiFi in public areas and a terrace with sunbeds. Apartments and villas offer a balcony or terrace with views of the swimming pool. They also include a seating area with a flat-screen TV and a CD player. Each accommodation type has a kitchen with a microwave, a fridge and an oven. A dishwasher, a stove and a toaster are also provided and guests can enjoy their meals in the dining area. This property is 23 km from Perpignan and 22 km from Saint-Cyprien Golf Course. Free private parking is available on site. Situated in Le Barcarès, just 7 km from Circus Casino de Port Leucate, Villa 8 De Oranje Tulp provides accommodation with a seasonal outdoor swimming pool, a garden, a terrace and free WiFi. The property features mountain views. The villa has 3 bedrooms and 1 bathroom with a hair dryer. A flat-screen TV is provided. If you would like to discover the area, snorkelling is possible in the surroundings. The nearest airport is Perpignan - Rivesaltes Airport, 21 km from the villa. Facing the Mediterranean Sea, Lagrange Vacances Les Maisonnettes is located in Sainte-Marie, less than 400 metres from Sainte Marie beach. It offers an outdoor pools and maisonettes with furnished terraces. Each maisonette has country-style decor. They are fully equipped kitchenette, a dining area, a TV, a seating area with sofa beds and a private bathroom with shower. Free private parking is provided. Lagrange Vacances Les Maisonnettes is 5 km from Canet en Roussillon, 9 km from Le Barcares and 17 km from Perpignan and its train station. Hotel Le Barcarès Preferred hotel ! 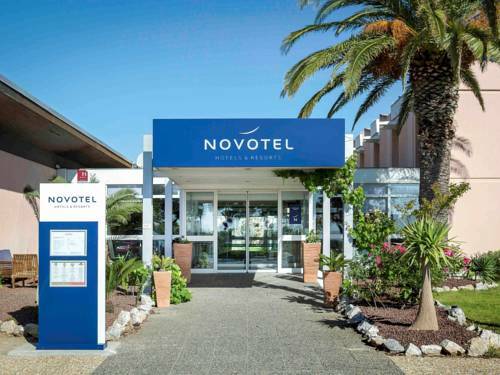 Located in Le Barcarès, in front of the sea, this hotel offers air-conditioned rooms, a snack bar and free Wi-Fi internet access in the public areas. A children playground and the local market can be found nearby. Offering views of the sea, all of the rooms at the Hotel La Casa Blanca are air-conditioned and have a private bathroom, a TV and free WiFi. A buffet breakfast is available and is served either inside or on the terrace with a sea view. Bikes can be rented near the property and the bus station is only 200 metres away. Perpignan is a 30-minute drive away and the Spanish frontier is 45 km away. Perpignan Airport is a 25-minute drive from the property. Free public parking is at your disposal nearby. Set in Le Barcarès, just 7 km from Circus Casino de Port Leucate, Residence Atlantis offers accommodation with free WiFi. Guests staying at this apartment have access to a fully equipped kitchen. The apartment comes with a TV and a living room. The nearest airport is Perpignan - Rivesaltes Airport, 21 km from the property. Located in Le Barcarès, within 7 km of Circus Casino de Port Leucate, Studio Grand Bleu is an accommodation offering sea views. Situated on the beachfront, this property has a shared lounge. This apartment is fitted with 1 bedroom, a satellite flat-screen TV, and a kitchen with an oven. The apartment also provides guests with 1 bathroom. The nearest airport is Perpignan - Rivesaltes Airport, 21 km from the property. Below here is the hotels map of Claira. Names and details of Claira hotels can be shown on the map clicking on the prices icons.